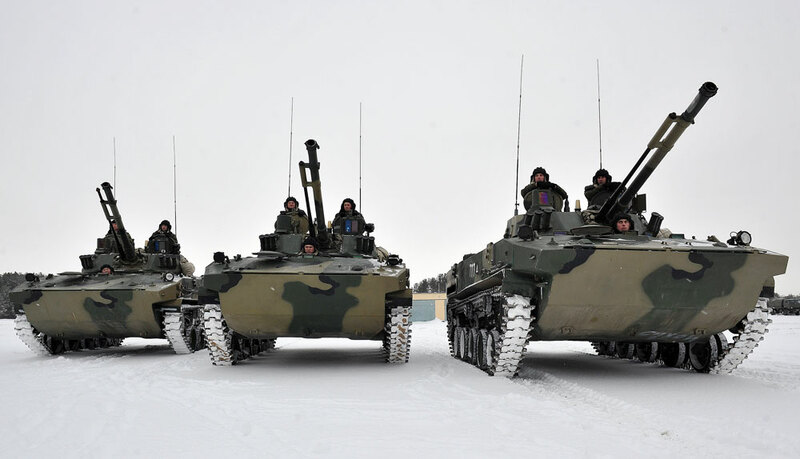 BMD-4 Bakhcha airborne combat vehicles. The Russian BMD-4M, an airborne infantry fighting vehicle (IFV), has undergone landing testing. The advanced Bakhcha-U parachute airdrop system gave the vehicle a relatively soft landing. From 2017, the country's airborne troops will be able to use the "flying" IFV, which can be dropped from the air directly onto the battlefield with its crew inside. Rigorous testing of the new Bakhcha-U parachute system, the modernized airborne infantry fighting vehicle (IFV) has seen it dropped from an Il-76 strategic airlifter 11 times since November 2015. This, incidentally, is also the number of main parachutes the Bakhcha-U system has: 11 giant domes each 350 sq m; the size of a large house. The technology used in these huge parachutes makes it possible to reduce the load on the crew in the vehicle during landing. Once the IFV has landed, the parachutes automatically detach, and the vehicle is immediately ready for battle. For landing troops far behind enemy lines, without the support of tanks or artillery, the vehicle is a boon. The modern BMD-4 has an excellent operating range (500 km (300 miles) without refueling), a high top speed (around 70 kph (40-45 mph), reinforced armour and enhanced firepower. These qualities enable an airborne infantry group to rapidly destroy the enemy on its territory while avoiding losses itself. Like its predecessor, the BMD-3, the BMD-4M not only drives and flies but also swims. In the water, it can reach speeds of 10 kph (6 mph), and water obstacles are no problem for it. This versatility is a mandatory requirement from Russia's military for armoured assault and infantry vehicles. All that remains is to bring the IFV directly to the battlefield and drop it from the aircraft safely for the people sitting inside it. The vehicle and its crew should not be separated. Troops lose valuable time after landing getting to the vehicle and getting it ready for combat; lost time in battle inevitably means more casualties. This is why the IFV's crew remain inside it during the airdrop. The BMD-4M's increased weight (13.5 tonnes, is 5 tonnes heavier than its predecessor, the BMD-3), because of ts modernized weaponry and increased ammunition, makes airdropping it safely for its crew without compromising combat qualities a very difficult challenge. The Bakhcha-U parachute airdrop system testing at the end of last year showed that the BMD-4M can be dropped from an aircraft with its crew inside safely for them, on a precise spot. Russia is the only country to airdrop a vehicle together with its crew. The French tried to develop a similar system, but abandoned the project after a fatality in testing. Other European nations have decided against airdropping vehicles with people on board. The Bakhcha-U parachute airdrop system testing has not been completed and will continue until the end of 2016, a spokesperson for the developers, Technodinamika, told RIR. The system will start being supplied to the armed forces in 2017.